What happens when the Whakatāne Menz Shed, Whakatāne Blue Light and the Rotary Club of Whakatāne get together? 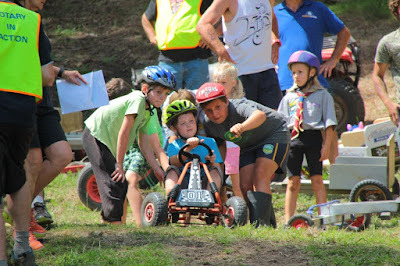 You get the seriously fun Grass Track Trolley Derby, which was on a sunny February afternoon at a farm in Awakeri, Whakatāne, NZ. The three community-based groups collaborated to organise and host the trolley derby which saw 59 children and 16 adults ranging from age five to 70 years old scooting down the hillside on trolleys of all shapes and sizes. There were plenty more watching the action and righting spilled trolleys or dusting off their children. The Menz Shed held two Saturday morning trolley-building workshops for those who didn’t already have a trolley of their own. These were a great opportunity to share and learn skills, and were well attended by enthusiastic children. The trolley derby was a great family event which was carried out with very little expense, thanks to the generous sponsorship of the Whakatāne Rotary and a minimal entry fee. Whakatāne Rotary will be looking to host the event again next year, so get your trolley-building plans in place for next summer! For more information, please contact Rotary Club of Whakatāne Director of Community Services Janie Storey via janie.storey@hotmail.com.